Nick Cooper is a special government agent who tracks down terrorists, and when the story opens, he is hot on the trail of a very talented computer hacker. Sounds like it could be the opening of almost any thriller available today, right? Wrong. The computer hacker is a Brilliant…a person gifted with extraordinary talents well beyond those of normal humans. 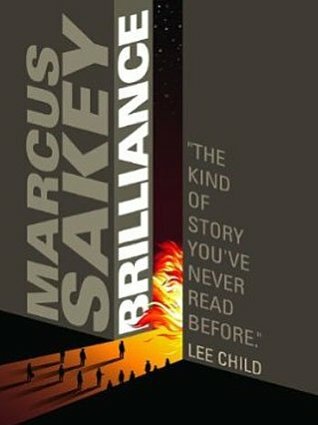 What is a Brilliant? Think the powers of an Idiot Savant–the ability to compute the value of Pi out to 1000 decimal places without effort–but without any of the other mental handicaps. And for some reason (maybe the emergence of Big Hair and rock bands), Brilliants begin to be born in the 1980’s; their arrival means a great change in the world. How do you deal with a man who can make $300 billion in the stock market as easily as the rest of us add two plus two? How can you fight against people who can out-think, out-plan, and out-maneuver you without even trying? Can society as we know it survive? The answer to this is complex and thought provoking. Is this a literary social commentary? No, this story is the X-Men, without the spandex, crossed with a Tom Clancy political thriller. Nick Cooper is a Brilliant himself; he can tell, from minute physical “tells,” what a person is going to do next; run, dodge, kick or punch. The longer he watches someone, he can also get a good sense who they are; liar, thief, assassin, murderer. He is very good at what he does. Yet, for all his talent, he is soon to find out that he is simply a pawn on a chessboard; who the players are is the real question. When a terrorist strikes and the New York Stock Exchange is destroyed, hundreds are killed. In an attempt to finally catch the man responsible, Nick will go deep undercover. It is then, he meets Shannon–the girl who can walk through walls–and through Shannon, Nick begins to understand how deep the rabbit hole goes. This story is a page-tuner–fast paced, with compelling characters. The first of a trilogy, I look forward to the next book.